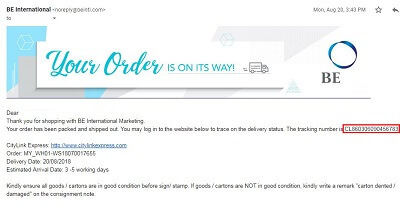 In the following article, I will share with you how you can check your BE International order delivery status. BE International uses the service of Citylink to deliver their parcels. 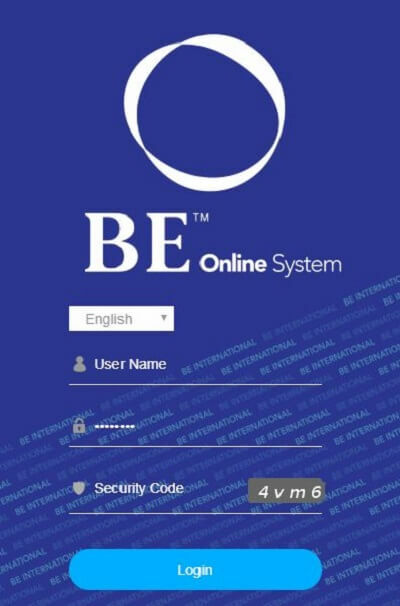 As a registered member of BE, you will receive an official tax invoice when you placed an order on the online shopping platform. 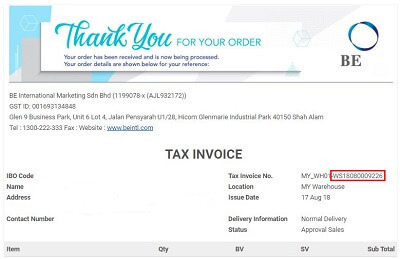 After your order has been processed, you will receive an official tax invoice in your email. The tax invoice you received will have all your order details. In the example above, the Tax Invoice Number is MY_WH01-WS18080009226. In order to check your Citylink delivery status, you can use the number WS18080009226 and input it into Citylink Track By Reference Number to check the status of your parcel. If you do not see any information when you input the number, it means your parcel is Not Ready for delivery yet. The second option to check your parcel delivery status is though the consignment number. When your parcel is ready for delivery, BE International will send out an email with Citylink Tracking Number. This is also known as Consignment Number. In the example above, the tracking / consignment number is actually 860306090456783. Use the number above and input into Citylink Track By Consignment Note system. When your parcel has been processed and collected by Citylink, you will see delivery information displayed.